And when it comes to these holy moly meatballs you see above – do those suckers look juicy or what? – you’ll never have any trouble cleaning your plate. Or asking for more. 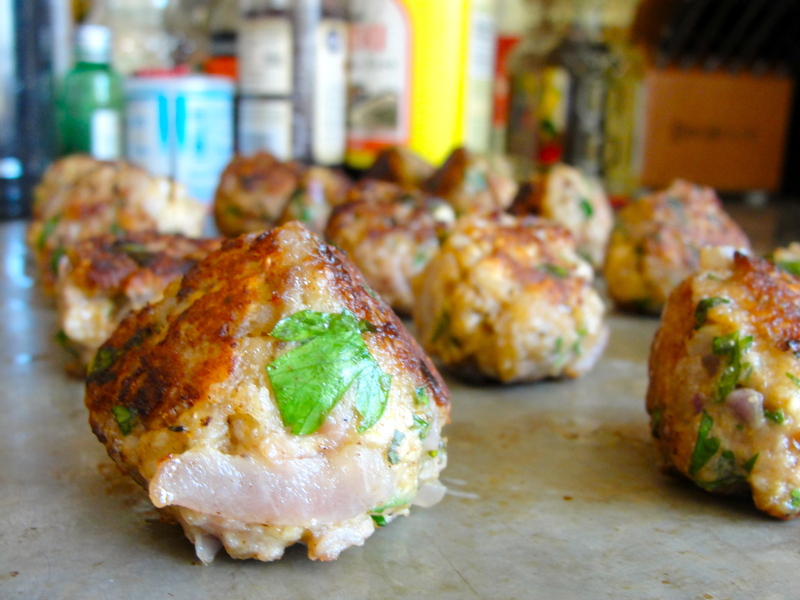 These little rounds of herb-flavored pork you see above are truly as succulent and savory as they look, each bite releasing a flood of flavor and begging you to grab another. And thanks to the addition of matzo meal, in place of regular bread crumbs, these scrumptious meatballs were also extremely low in sodium. 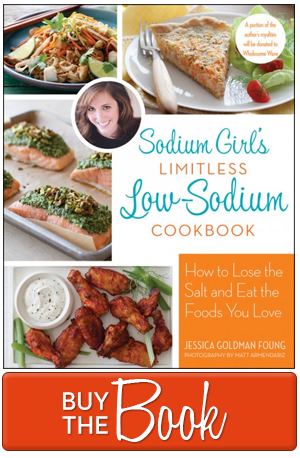 The only thing adding salt to the recipe was the natural salinity in the pork. Now what do you think about that? But enough kibitzing, let’s get to the point. The recipe is quite simple and requires you to get a bit dirty, gently mixing the meat, matzo meal, and eggs with your hands. So break out the soap and roll up your sleeves, because a little manpower is worth the resulting taste. I also believe that the more fresh herbs the better (you just can’t compete with their pungent smells), but dried herb mixes, like Penzeys Pasta Sprinkle, work perfectly well too. And to serve, nothing beats fresh spaghetti and a sauce made from oven-roasted tomatoes. But if you don’t have the time to fashion your own Italian fare at home, simply pick up packaged noodles and Muir Glen No Salt Added Tomato Sauce from the store. Or, if you really want to think outside of the low sodium box, skip the pasta altogether and skewer the bite-sized nuggets with toothpicks for appetizer fun. Accompany them with a stoneground mustard sauce on the side and you’ll have a one-stop popper that will satisfy any guests. Even the Morton salt girl. Get creative. Get meaty. Chow on. 1. In a large, nonstick pan, heat a bit of canola oil (1 teaspoon) and sauté the garlic and onions for five to ten minutes. 2. Take pan off of heat, and transfer the now translucent-ish onion and garlic mixture to a medium sized bowl. 3. 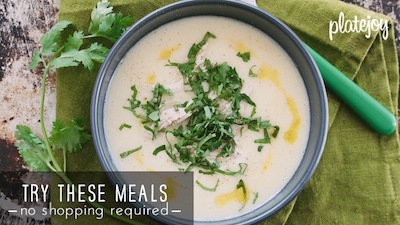 In a smaller bowl, combine the breadcrumbs with the cream and allow them to soak for five minutes. 4. Add the ground beef, the eggs, the herbs, the spices, and the soaked breadcrumbs to the onion-garlic mixture. Gently fold the ingredients together until all parts have been well distributed. You may find that the breadcrumbs clump into little balls so, while you want to avoid over-mixing the “meat batter,” feel free to break up the clumps by rubbing them between your fingers. 5. Reheat non-stick pan with a few more tablespoons of canola oil. 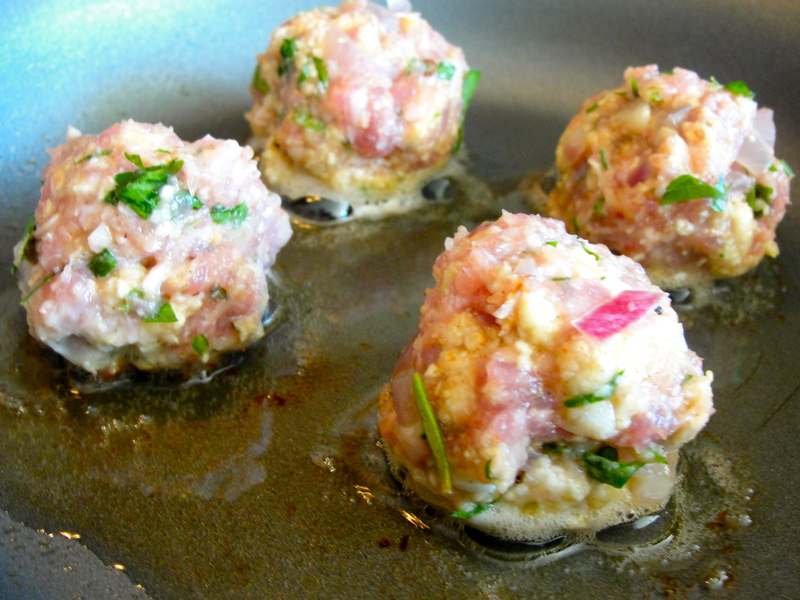 Shape meat into balls that are a little smaller than a golf ball and add them to the sizzling oil. Do not overcrowd the pan and allow the meatballs to brown for five minutes on each side. I found that is easiest to use a fish spatula to turn and remove the meatballs from the pan without breaking them apart. 6. 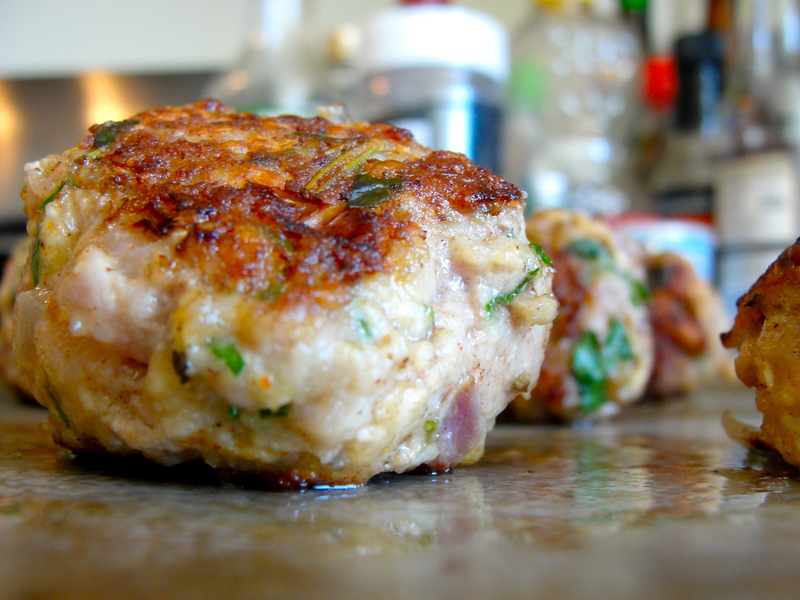 Place browned meatballs on a cookie sheet, and repeat with another batch until all the meat is gone. 7. To finish the meatballs, you have two choices – you can add them to the sauce, where they will continue to simmer for another 20 minutes. Or, if you are going sauceless, throw them in the oven for 10 minutes on 350 degrees so that they cook through. Then, enjoy. What’s the point…it’s pork, why bother with the Matzo Meal? What do you mean? Because it is ironic or because the matzo is not needed to hold the meatballs together?